York College offers two residence halls and two on-campus apartment complexes. York College is a fully residential campus because of YC's strong belief in the benefits of a co-curricular environment. 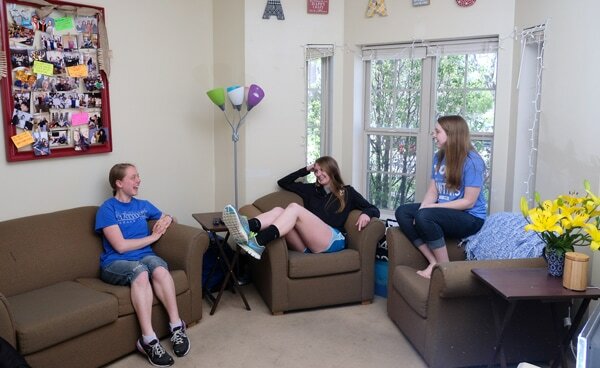 Our Residence Life staff is committed to providing an environment where all students can feel safe. The educational philosophy of York College involves the development of the whole person. Residence life is an important aspect of the co-curriculum where students grow socially and spiritually, as well as academically. The mission of Residence Life at York College is to provide a healthy community environment supportive of each student's need for living and desires for personal growth. Please contact Collin Tucker, Director of Residence Life and Housing at (402) 363-5718 or ctucker@york.edu with any questions. Laundry facilities and change machines are available in each residence hall. The college has both regular and extra long twin mattresses. It is suggested that you buy extra long sheets so that they will fit either. Internet access is available in each room. See the Computer Usage Policy in the Student Handbook for further details and PantherNet registration and usage requirements. Your friends and relatives are always welcome at York College. Please refer to the Student Handbook for guidelines regarding guests and visitation. Your safety is of great importance to us. While York is a safe, small town, we urge you to use wisdom in regard to decisions that affect your personal safety. Curfew: Underclassman residence hall curfew hours are 12 a.m. (midnight) every night except Friday and Saturday, which is 1:00 AM. Your RA will check you in at the appropriate time. Residence halls remain locked at all times. Security: You are advised to lock personal property in your room and lock bicycles to the bike racks. The college is not responsible for any personal property that is lost, stolen, or damaged. We encourage students to look into purchasing renters insurance. The college reserves the right to search any room if there is any reason to believe a violation of college, local, state, or federal laws may have occurred. Appropriate college personnel have the right to enter a room for maintenance and health and safety inspections. 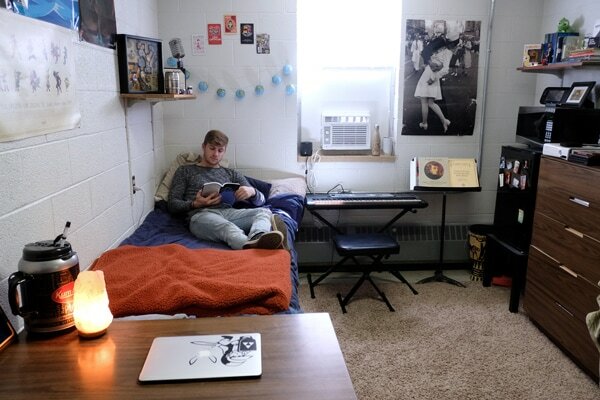 Furnishings: Rooms are furnished for one or two students; each student having a bed, a dresser, a desk and a chair. This furniture may not be removed from the room. Rooms are also equipped with mini-blinds. Anything used in decorating should not deface the room in any way. Floor Size: 10'4" x 14'2"
Basement Floor: 32" x 60"
1st and 2nd Floors: 32" x 53"
Upperclassmen (upperclassman status is 21 years of age or completion of 60 credit hours) may choose to live in the campus apartments. Each apartment has four single occupancy bedrooms, two baths and a shared kitchen and living room area. The bedroom window size and floor dimensions vary. The student apartments are fully furnished; however students may wish to bring some small items to personalize their living space. Bean bag chairs are allowed, while recliners and couches are not. Students may bring lamps, storage containers, and decorations as long as they can be moved to the apartment without potential for causing damage to the building. Only one microwave is allowed per apartment. Personal refrigerators are not allowed in the apartments, as each apartment is furnished with a full size refrigerator.